For the last ten days or so, I've been sneezing like crazy. Springtime in Parker - when ragweed is in bloom, and the pollen invades my immune system like the Assyrian hordes. 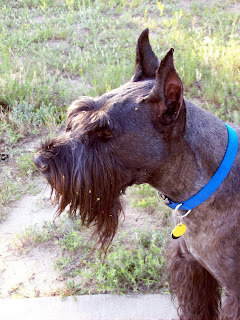 Yes, that would be Boogie the Giant Schnauzer, with ragweed pollen all over his head, which he graciously drags into my demesnes on a daily basis. Like every pooch on the planet, he considers his daily walkies to be the perfect opportunity to stick his face into every piece of stray vegetation on our route. The result, of course, is that his long beard, eyebrows and fuzzy legs become the perfect vector for transporting the bane of my mucus membranes all over the house. Bless his pointy little head. Mom, I don't think that's a viable option, for reasons that should be obvious. And Karl, the vision of my 100 lb Boogie in a hamster bubble rolly thing HAS MADE MY DAY. Janiece, right before you bring him back in, tickle his ears with a feather or something. That should cause vigorous shaking of the head, and help ensure that stray pollen gets "All Shook Up". Or should that be "all shook off"? Just had a vision of Boogie as Elvis. "Woof, woof, I'm all shook up!" In a hamster bubble rolly thing.